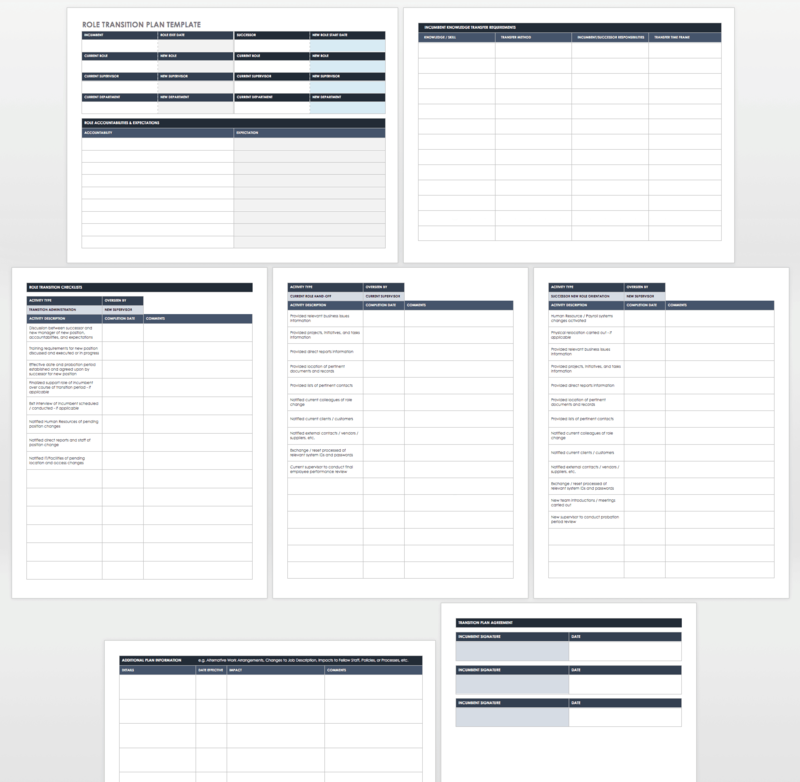 Download professionally designed, free templates for business and project transition planning. Choose from a range of the most popular customizable templates for business, including transition plans for specific jobs, organizational changes, business planning, and ongoing projects. What Is a Transition Plan for a Company? What Is a Management Transition? What Is a Transition Strategy? What Is Included in a Transition Plan? Use this template as a leadership transition plan template or to transition staff into and out of any role. The template provides an outline for adding your own details related to role responsibilities, knowledge transfer, and implementation schedule. The layout includes a checklist to help you create and track your transition timeline. Calculate the time needed for each aspect of a transition with this employee transition plan template. Enter your estimates for the amount of time required for training, transferring assignments, and other activities, and the calculator will automatically show the breakdown along with the overall timeline. This template can also be used by incumbents to track the amount of time spent on various tasks so that successors can get an idea of the responsibilities and time commitments required for a given job. 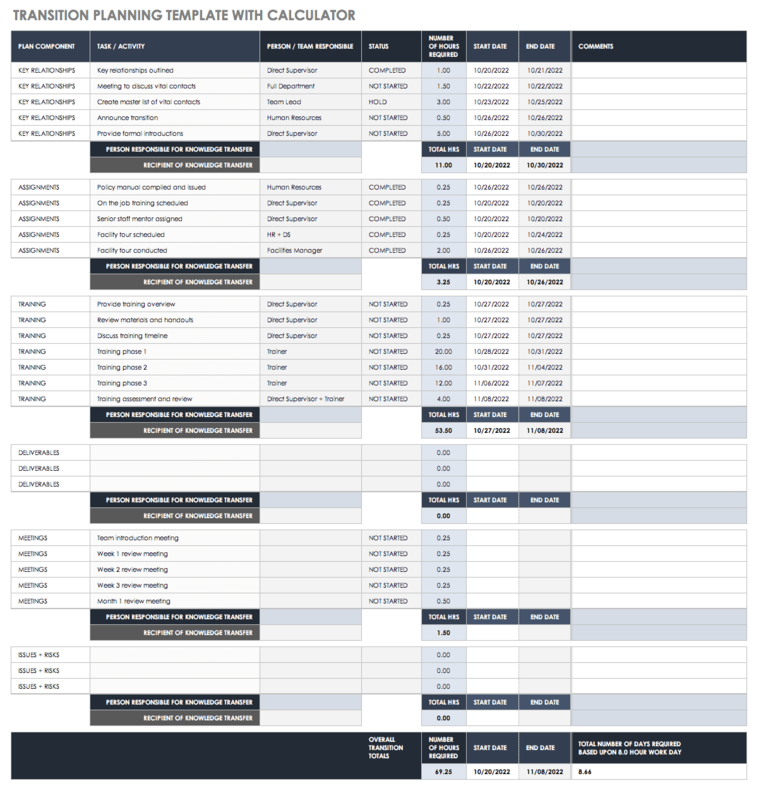 Fill out this simple spreadsheet to create an organized project transition plan. Sections are provided for listing goals, risks, transition team roles, tasks, and training requirements. Add starting and ending dates next to each item for a clear timeline. If you need more comprehensive plan, insert additional rows for a customized transition template. 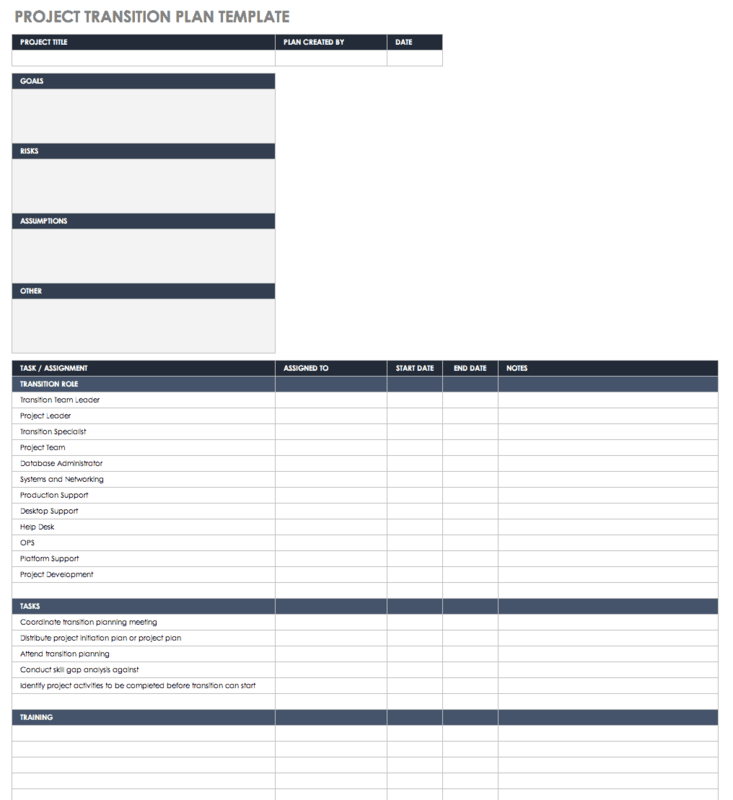 This template is intended for consolidating knowledge into a single spreadsheet that you can easily share with colleagues. Incumbents can enter information about current projects, important contacts, deadlines, issues, and documents that successors will need to access. There is also space to add comments, and you can modify the template to include additional columns. This business transition planning template provides a detailed outline to guide your strategy and planning efforts. Add your own copy to describe the situation and changes taking place, the impact of the transition on different business elements, the timeline for implementing the plan, communication issues and strategies, and other details. You can also use this template for organizational changes that may have a widespread impact on a business. Use this job transition plan template to manage a role shift from an outgoing contractor to an internal team member. Describe the purpose of the transition plan and its objectives, contract details, risks, knowledge transfer, and a schedule of related activities. This is similar to other work transition plan templates, but it is specifically designed for contract employees. A transition plan is a document that helps companies navigate changes such as retirement or resignation from leadership roles, structural changes within an organization, mergers with other companies, or transitions between stages of business planning. While the types of changes and level of risk may vary among organizations, transition planning is important for all companies in order to anticipate and facilitate successful change. Additionally, transition plans can help an individual navigate career changes and ensure that leaving a job is done well. Planning also helps to pass knowledge down to successors so that expertise is retained. A management transition can refer to employees moving into management roles, whether high-level executive positions or lower-level jobs. This transition may occur due to a business owner retiring or selling a company, business growth leading to a need for new managers, or career changes due to promotion or other factors. Transition strategies vary depending on the business context and type of change. There are numerous scenarios that could lead to major transitions — a CEO’s retirement, company performance issues, or the growth of a new startup — and each requires a different strategy in order to manage the change effectively. There is no one-size-fits-all transition strategy; rather, you should tailor your plan to your specific business needs. Part of transition planning is to think strategically about business objectives, management needs, and potential risks so that transitions can be handled in a way that works for the business — rather than against it. Whether you’re making a transition plan for leaving a job, starting a new job, shifting employee roles, or other work transitions, using a template provides an outline to follow. The transition plan document may also include signature lines to show agreement among the incumbent, supervisors, and other parties involved. Business transition plans may also provide information about organizational readiness, business value, or detailed change control procedures, depending on the nature of the transition. Duties and Responsibilities: These can be ongoing, such as meetings that are regularly attended, as well as non-recurring activities, and can be organized into daily, weekly, monthly, and annual tasks. Note responsibilities so that work can continue uninterrupted during a role transition. Assignments: This includes descriptions of current projects in progress and the status of each, coworkers and other important contacts involved, upcoming deadlines, and expected deliverables. Key Contacts: Internal or external relationships may be vital to the job. Passing these contacts to a successor helps to maintain these relationships and keep business running smoothly. Knowledge Transfer: This section starts with a list of key knowledge and skills required for the position, which may include the use technology and specific processes. Also document how you’ll transfer that knowledge, a timeline for transitioning knowledge, and training plans. You may present this list as a checklist to break down knowledge transfer steps and provide an action plan. Issues and Risks: This area may include current issues that the position is dealing with or potential risks that need to be considered. Project Scope: A transition plan may include an overview with a description of the project, the expected impact of the transition, and supporting documentation. Logistics: This section describes required resources such as software, staffing needs, or facilities to be used. It may also cover maintenance and support requirements related to computer systems, technical equipment, security, and related contracts. A maintenance plan may also include associated costs and budget details. Communication Plan: Some plans include communication plans for both staff and stakeholders. You can also use this section to define procedures for reporting and other communications during the transition. Risks: Once you identify risk factors, list them based on priority along with mitigation plans. Be sure to update the transition plan as issues arise and to track the progress of mitigation plans. Key Staff: Transition team members are often listed along with contact information and descriptions of their roles. You may also document changes in responsibilities. Transfer of Knowledge: New skills and associated training may be needed to help staff adjust to project updates, new equipment, or role changes. Product Delivery: If relevant, the plan may provide details on the release process for deliverables, such as data migration, testing, and problem resolution for software products. Implementation: A schedule for implementation outlines the steps involved along with a timeline for each activity. Transition Acceptance: This may be a section to get approval from the project manager and other stakeholders, or specific to a customer that needs to accept the transition plan before implementation can proceed. Depending on the scope of a project or the type of transition, planning can be a complex and time-consuming process, but the importance of using a strategic approach and creating thorough documentation can’t be overstated. Whether you’re creating a transition plan for a role change, project, or transfer of knowledge, it’s imperative to maintain documentation of critical elements and responsibilities. To ensure a smooth transition that doesn’t disrupt business, look for a tool that allows you to share and collaborate on the transition plan with team members and key stakeholders. Discover why millions of professionals around the world use Smartsheet to move from idea to impact fast.